I’ve been dyeing. I was holding off telling you, waiting to do a big reveal — just the right moment — but I can’t contain it any longer. Just a bit of the wool I've dyed. Check out the Fiber Arts Friday roundup at Wisdom Begins in Wonder to see what other people are crafting this week. 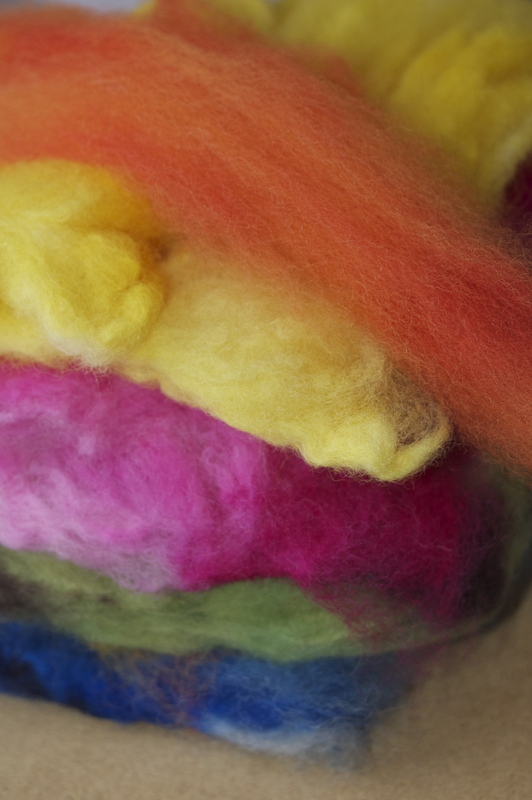 This entry was posted in spinning and tagged dyeing, fiber arts, fiber arts friday, wool. Bookmark the permalink. Those are awesome colors you made!!! if you like doing sold colors then you will love doing painting & kettle dyeing ..
Beautiful! (you fiber tease!!!) I’m excited to see where you are headed with this! So pretty! You do the dying yourself? Yes, this is fiber I dyed. That is amazing – I tend to like greens and love the shade you have in the picture. Those colors are awesome – every one tulip-like, except the blue. Wish someone would come up with a blue tulip. I’d love that! Definitely vivid this time, yep! Such yummy colors! They feel like summer to me! I can definitely see that! WOW!!!! So pretty. Vibrant is the word mom and I used when we saw them. Very pretty. No wonder you could not keep it to yourself any longer. Wow, beautiful job! I can’t wait to see it spun. Do you have an idea what ply etc you will be making it into? Or what you want to make with it once you’ve spun it? Colors are sooo pretty, I think I like the peach/orange best! thanks for stopping by my blog today! Your blog is great…you’re a word lover, too, I see! Yes, I am! And thanks. Those colorways are GORGEOUS. I love the orange and the yellow, they feel like spring!! Oh, those are beautiful! I think that fabulous pinky-sherbet-orange right on top is my favorite, I just want to wrap it around my hand and stare at it for a while. And then maybe turn it into something needle-felted. The blue is my favorite. They’re all very nice, though. I love to spin, and I have dyed some, with Kool-aid and Jacquard Acid. Glad you’re enjoying it! Beautiful colors! Your Green on the bottom really catches my eyes. Wow! Those are gorgeous! I’m so impressed! I’ve been having so much fun with this! Those are sensational colors! I love every each one of them! Oh my! What glorious colors! Just think of all the wonderful items that those colors will fill with cheer!